Treatment of chronically infected wounds is a challenge, and bacterial environmental contamination is a growing issue in infection control. Ozone may have a role in these situations. The objective of this study was to determine whether a low dose of gaseous ozone/oxygen mixture eliminates pathogenic bacteria cultivated in Petri dishes. A pilot study with 6 bacterial strains was made using different concentrations of ozone in an ozone-oxygen mixture to determine a minimally effective dose that completely eliminated bacterial growth. The small and apparently bactericidal gaseous dose of 20 μg/mL ozone/oxygen (1:99) mixture, applied for 5min under atmospheric pressure was selected. In the 2nd phase, eight bacterial strains with well characterized resistance patterns were evaluated in vitro using agar-blood in adapted Petri dishes (105 bacteria/dish). The cultures were divided into 3 groups: 1- ozone-oxygen gaseous mixture containing 20 μg of O3/mL for 5 min; 2- 100% oxygen for 5 min; 3- baseline: no gas was used. The selected ozone dose was applied to the following eight strains: Escherichia coli, oxacillin-resistant Staphylococcus aureus, oxacillin-susceptible Staphylococcus aureus, vancomycin-resistant Enterococcus faecalis, extended-spectrum beta-lactamase-producing Klebsiella pneumoniae, carbapenem-resistant Acinetobacter baumannii, Acinetobacter baumannii susceptible only to carbapenems, and Pseudomonas aeruginosa susceptible to imipenem and meropenem. All isolates were completely inhibited by the ozone-oxygen mixture while growth occurred in the other 2 groups. A single topical application by nebulization of a low ozone dose completely inhibited the growth of all potentially pathogenic bacterial strains with known resistance to antimicrobial agents. Numerous alternatives for the treatment of chronically infected wounds have been described in the literature. The real role of various agents, topically applied, remains undetermined [1–3].Topical application of antibiotics has shown limited efficacy in the management of infected wounds, without conclusive results [4, 5]. In the last several years, various in vitro and in vivo experimental and clinical studies have investigated the bactericidal effect of the topical application of ozone in different situations, including the management of infected wounds [6–8]. O3 is a potent oxidant and an important disinfectant, acting on microorganisms by means of oxidation of their biological material . It has been reported that O3 can be employed as a bactericidal agent under various forms, such as ozonized saline solution , ozonized water , ozonized oil , ozone associated with other substances , and more frequently the gaseous O3/O2 mixture . The topical use of O3 has also been reported for environment decontamination in diverse situations: in agriculture for food decontamination , in odontology , and in clinical settings such as in the treatment of infected wounds . Gaseous ozone has also been potentially considered for the disinfection of the hospital environment, which can be a source of microorganisms for patients . However, a minimal effective antibacterial dose of gaseous ozone for topical application has not been clearly determined . The objective of this study was to determine whether a low dose of O3, in a gaseous O3/O2 mixture, applied to Petri dishes containing bacterial culture completely eliminates the growth of different bacterial strains. The strains chosen in this study were those that were important pathogens of nosocomial and community-acquired infections and those with known mechanisms of antimicrobial resistance. This study was performed at the 3rd Division of Clinical Surgery and Laboratory of Medical Investigation (LIM-54 and 62), of the Hospital das Clínicas of the University of São Paulo School of Medicine. The project was approved by the Ethics Committee of the Institution. 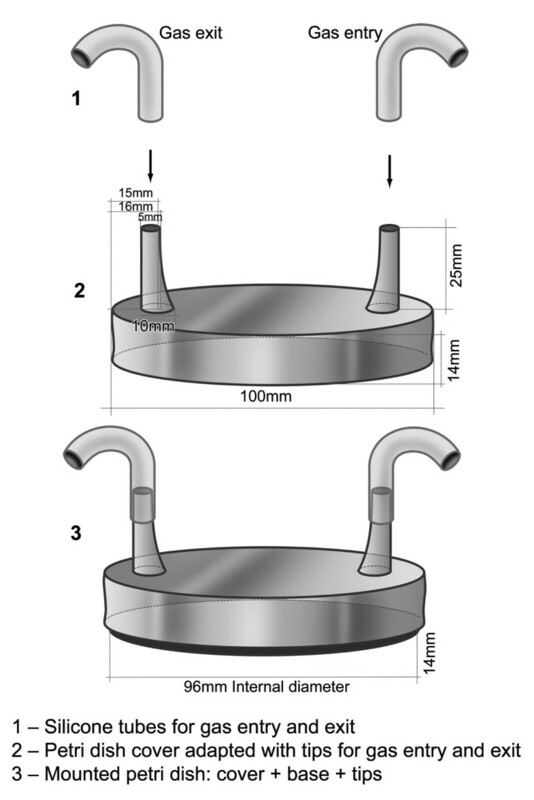 For bacterial culture, Petri dishes (90 mm internal diameter) were adapted with the addition of two special tips in order to allow continuous gas entry and exit (Figure 1). The study was done in two phases: a pilot test (1st phase) to determine the dose of O3/O2 to be later employed in the evaluation of its bactericidal activity when applied to different bacterial strains (2nd phase). In both phases, bacterial strains were inoculated on agar-blood in the adapted Petri dishes, at a concentration of 105 bacteria/dish. 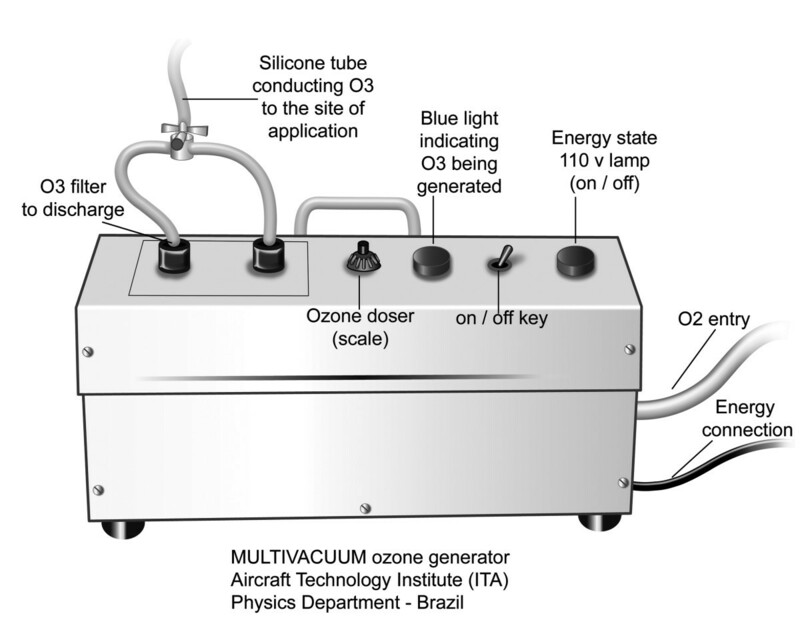 Ozone gas was produced from medicinal oxygen (liquid oxygen with a degree of purity of 98%) by means of a medicinal O3 generator provided by the Gas Department of the Aircraft Technology Institute (Instituto de Tecnologia da Aeronáutica – ITA, Brazilian Army, São José dos Campos, Brazil). This instrument was equipped with an oxygen flow controller (MKS – Type 1179ª) with 0.01 min precision, in which a controlled oxygen flow passes through a glass cylinder and is exposed to an electric discharge by a dielectric barrier with controlled potency and voltage (Figure 2). The electric discharge generates O3 and its concentration can be measured. The final product is a gaseous O3/O2 mixture, in which the concentration is regulated by variation of oxygen flow and the voltage applied to the electrodes. Schematic representation of adapted Petri dish with the addition of two special tips in order to allow continuous gas entry and exit. Schematic representation of a medicinal O 3 generator equipped with an oxygen flow controller with 0.01 min precision, in which a controlled oxygen flow passes through a glass cylinder and is exposed to an electric discharge by a dielectric barrier with controlled potency and voltage. In this phase, Escherichia coli – ATCC:35218, Staphylococcus aureus susceptible to oxacillin – ATCC:25923, and Pseudomonas aeruginosa susceptible to imipenem and meropenem – ATCC:27853 were inoculated on agar-blood in Petri dishes and incubated aerobically at 35±2°C for 18 to 24 hours. A standardized inoculum was prepared using the direct colony suspension by making a saline suspension of isolated colonies selected from blood agar plates. Each bacterial suspension was adjusted to 0.5 McFarland turbidity standard (1 to 2 x 108 CFU/mL) using a photometric device (colorimeter Vitek®1, BioMérieux, Etoile, France). The 0.5 McFarland suspension was diluted 1:1000 in sterile saline, resulting in a tube containing approximately 105 CFU/mL. An aliquot of 10μL of this suspension was inoculated in another blood agar plate (final concentration of 103 CFU/mL). Then the dishes were then subjected to decreasing doses of O3, starting with 100 μg/mL. Initially, the plates were exposed for 60 min. The time and the dose were subsequently decreased. The minimal dose and time required to completely prevent bacterial growth of the three microorganisms was determined (20 μg/mL for 5 min). O3 was then applied at the dose of 15 μg/mL for 5 min to six bacterial isolates (Escherichia coli – ATCC: 25922; Staphylococcus aureus resistant to oxacillin –ATCC:29213; Staphylococcus aureus susceptible to oxacillin – ATCC:25923; Enterococcus faecalis resistant to vancomycin – ATCC:51299; Klebsiella pneumoniae – ESBL-producer, susceptible only to carbapenems – clinical isolate from a patient, obtained as part of standard clinical care; and Pseudomonas aeruginosa – susceptible to imipenem and meropenem – ATCC:27853). The experiment was repeated four times for each microorganism, and the effects were evaluated. For this phase of the study, eight potentially pathogenic bacteria strains were included, comprising the six employed in the first phase plus Acinetobacter baumannii susceptible only to carbapenem – ATCC:19606 and Acinetobacter baumannii resistant to carbapenem – clinical isolate from a patient, obtained as part of standard clinical care. Each strain was inoculated on agar-blood in four Petri dishes, and the colony forming units (CFUs) were counted at 24 h and 48 h following the treatment applied to each group. Three study groups were employed: the experimental group treated with 1% O3/99% O2 gas, corresponding to 20 μg of O3/mL (O3-group); and two control groups, including one treated with 100% oxygen (O2-group), and one called the Baseline group in which no gas was used. Each bacterial strain was inoculated into four adapted Petri dishes, and 10 min later each dish (except for the Baseline group) received gas nebulization for 5 min, under atmospheric pressure. Thereafter, each dish was incubated at 37°C for 48 h. Colony counts were performed 24 h and 48 h following inoculation. Statistical analysis of the results was performed using the Mann–Whitney Test to compare the global results obtained for the O2-group with those of the Baseline group after 24 and 48 h. The Kruskal-Wallis test was employed to compare the CFU counts of each bacterial strain with those of other strains, either within the same group, or of other groups. A p value < 0.05% was considered significant. The initial tests with the E. coli, S. aureus, and P. aeruginosa strains demonstrated that doses greater than or equal to 20 μg of O3/mL for 5 min totally prevented the growth of these three bacterial strains. However when 15 μg of O3/mL was applied for 5 min and the effect was evaluated on six bacterial strains, a low number of CFUs were present 48 h after inoculation for two of the six tested strains (Table 1). Therefore, 20 μg of O3/mL in the O3/O2 gaseous mixture for 5 min was chosen as the dose for the 2nd phase. CFU: Colony-forming units: each experiment was repeated 4 times (P1 to P4). The results are expressed as bacterial strain CFUs per experiment. All experiments for the O3-group showed complete inhibition of bacterial growth for all strains at 24 h and 48 h. This was statistically significant when comparing O3-group with each other group (p<0.014 for each bacterial strain). No difference in bacterial counts (p: 0.80) was noticed between the other two groups (Table 2). In Baseline and O2-groups, Acinetobacter baumannii resistant to carbapenems, presented CFU counts at 24 h and 48 h significantly greater (p<0.05) than all those of the other strains, except Enterococcus faecalis. For each bacterial strain, no significant difference was observed in CFU counts at 24 h compared to that at 48 h.
5= ESBL producing Klebsiella pneumoniae susceptible only to carbapenems –clinical isolate from a patient. 6= Acinetobacter baumannii resistant to carbapenem – clinical isolate from a patient. ESBL: Extended-spectrum beta-lactamase; CFU: Colony-forming units; each experiment was repeated 4 times (Plates: P1 to P4). The eight bacterial strains employed in this study were selected to represent pathogenic bacteria commonly present in patients with severe nosocomial infections, with known resistance to antibiotics. Our results showed that the application of a low dose of gaseous ozone completely prevented the in vitro growth of all bacterial strains. On the other hand, in both control groups, bacterial growth occurred in all eight bacterial strains and treatment with 100% O2 had no effect on bacterial proliferation, compared with the Baseline group. In the 1960s, Scott et al., using topical application of ozonized saline, showed that approximately 2 × 107 molecules of O3 per bacterium provoked 50% death . They attributed this to O3 reacting with lipid double bonds, thus leading to bacterial wall lysis and bacterial cell content extravasation . By entering the cell, O3 promotes oxidation of nucleic and amino acids; and cell lysis depends on the extent of these reactions . The culture medium employed in this study was agar-blood in Petri dishes. The use of agar for bacterial culture in Petri dishes is usual practice in microbiology, including the evaluation of bactericidal effects of different substances, such as ozone. An in vitro study aiming at decontamination with prolonged (4 h) application of gaseous O3 (2 ppm), revealed a reduction of viability of various bacteria, such as E. coli, S. aureus, Serratia liquefaciens, and Listeria innocula, suggesting a disinfectant effect of O3. The bacteria were cultured on agar in Petri dishes as well as in other culture media, and the author considered agar as the best culture media for measuring the efficacy of O3 . Pereira et al. reported that application of a gaseous O3/O2 mixture (0.4%/99.6%) for 1 h, at constant pressure and flow (11 mm Hg and 2 L/min, respectively) and controlled temperature, in plates containing 104 CFU/mL of E. coli, S. aureus, and P. aeruginosa led to total inhibition of growth of these bacteria . Compared to this study, the O3 concentration in the gaseous O3/O2 mixture in the present study was 2.5 times greater, the duration of application was much shorter (1/12), and the gas flow was half (1 L/min). Furthermore, in the present study, potentially pathogenic bacteria with higher inoculums and known antimicrobial resistance were selected. Due to these differences, comparison of these studies is not viable. Other in vitro studies involving gaseous ozone have been performed but cannot be compared with our study as they involve Thichophyton spp. , mutans streptococci  and Listeria innocua . The potential of our findings is interesting. The hospital environment has been increasing implicated in the transmission of resistant bacteria such as methicillin-resistant S. aureus and enterococci [22, 23]. Environmental cleaning and the application of hydrogen peroxide in the environment have recently deserved attention [24, 25] and ozone may have a similar use. In 1973, Broadwater et al. determined the minimum dose of O3 dissolved in water (ozonized water) needed to eliminate the growth of three bacterial species when applied for 5 min. They observed that 0.12 mg/L of ozone was lethal for Bacillus cereus; and that 0.19 mg/L was lethal for Bacillus megaterium and E. coli . Although O3 dissolved in water was employed for surface decontamination, there was no clear definition of a minimum effective dose for its application. Likewise, there is no clear dose for O3 in the form of an aerosol (O3 dissolved in air) to be employed for surface decontamination of scientific instruments [26, 27]. Also focusing on environment decontamination, Li analyzed the resistance of various bacteria exposed to O3 for surface disinfection, and pointed out the importance of the species (E. coli was more susceptible) and of the O3 dose (concentration × time of exposure) on resistance to O3 29. In the present study the dose of O3 employed totally prevented the growth of all bacterial strains although Acinetobacter baumannii had a greater inoculum than the other bacterial strains. A concern involving the use of environmental O3 for environmental disinfection is its toxicity, especially to the lungs  as the epithelial lining fluid has a relatively poor antioxidant capacity when compared with the blood. To enable the use of ozone in the hospital environment, exposure of patients and healthcare workers to inhalation would have to be avoided. Another potential use for ozone is in the treatment of infected wounds. A clinical study reported that in the case of superficial wounds with antibiotic resistant sepsis following trauma and surgery, the application of O3/O2 resulted in wound healing and control of sepsis . Sanchez et al. reported the efficient management of diabetic foot with gaseous O3/O2 application . In a clinical prospective study , 61 patients with “diabetic foot” infections were randomized into two groups: topical gaseous O3 application (80μ/mL maintained during 20min/session) + conventional (debridement + wound dressing) vs placebo (O2 treatment). Although in the whole population the wound closure in the ozone group vs placebo (41% vs 33%) was not significant, it was observed that in the 34 patients who completed the study (16 of O3 and 18 placebo) the wound closure was significantly higher in the O3 group (81% vs 44%); and for patients with wounds ≤ 5cm2 the total closure was higher in the O3 group when compared with placebo (100% vs 50%; p=0.006). This suggested that O3 was superior to conventional treatment. However it is difficult to draw conclusions from such a small study. A point of concern is the toxicity of ozone to the skin. The skin is protected against oxidative stress by a variety of antioxidants , but chronic exposure to O3 can be deleterious to the skin, especially to the stratum corneum, leading to a cascade of effects in the deeper layers. Brief topical exposures of O3, however, have been shown to be non-toxic . Our study presents the following limitations: it is a preliminary evaluation and focuses on the in vitro effect of a minimal dose of ozone applied in Petri dishes containing bacteria seeded superficially on the Agar medium. It is not yet clear how well our findings may translate into clinical practice in which factors such as variable blood flow, with ischemia, necrotic tissue and high bacterial burdens may play an important role, especially in the diabetic foot. In conclusion, the results of the present in vitro study showed that a dose of 20 μg of O3/mL in a gaseous O3/O2 mixture (1% O3/99% O2), in a single topical application by nebulization for 5 min under atmospheric pressure, effectively inhibited the growth of all potentially pathogenic bacterial strains with known antimicrobial resistance. This study did not receive external funding. None of the authors have competing interests concerning this study. Belchor Fontes- study design, analysis of data, and writing of manuscript. Ana Maria Cattani Heimbecker- laboratory work. Glacus de Souza Brito- conception of study. Silvia F. Costa- laboratory supervision. Inneke M. van der Heijden- laboratory work. Anna S. Levin- analysis of data, critical review of manuscript. Samir Rasslan: final approval of the manuscript. All authors read and approved the final manuscript.